My Wednesday evenings are one night of the week where both of my guys are gone, and I have been really treasuring the ‘Alone’ time, pampering myself with candlelight, a glass of wine, classical music and usually some simple meals that are for my mouth only. Do you eat differently when you’re alone? And I don’t mean standing over the sink munching on peanut butter off a spoon, or eating dry cereal by the handful while watching TV, what I mean is, do you take the time to really nurture yourself with good food when you’re alone? Because you should. It’s delightful, really. And with the way most people seem to cram their lives with activity and movement, some time alone is one aspect of our lives that we so desperately need. I know that for myself, I thrive on having some time that is just mine. And my life is pretty simple too; I don’t have much now that pulls me in every direction but that doesn’t change my need to be with myself, to remember what I like and enjoy, to be kind to the ‘Me’ that I know, to who I am. I’ve been this way ever since I can remember. So my Wednesdays are a treasure. It’s my time to let go a deep sigh as I take in the empty house, and peruse the fridge for a few simple ingredients to fill my tummy. Since I won’t be off-putting to my egg-hating husband, many of these meals will include the cooking of eggs. One week it was a spicy dish of cooked chorizo and potato, topped with a hard-cooked egg, there was the phenomenal and by far most popular of blog posts when I made the shirred eggs in potato skins– that occurred on my solo Wednesday evening, and then just recently, with the desire to make something unique, I created a roasted rutabaga and poached egg dish that was divine, yet so simple and amazing. I need to confess something about eggs; while I love them dearly, and really, think that it is one food item that I will never give up eating, I have been rather stubbornly affixed to only consuming them when cooked good and solid. I’ve had an aversion to the soft yolk ways for as long as I can recall, and I simply can’t say why. I don’t care for them scrambled either, and no matter how well they’re scrambled, so soft and pillowy and silky smooth, I just won’t eat them. I think it must be the texture. As I’ve grown and watched my food tastes change, the one aspect of it that I’ve noticed is that formerly despised foods were all about texture over flavor. Still, as I can now manage mushrooms, squash, tomato, avocado and a host of other goodies that were once verboten on my table, I draw the line at scrambled eggs. 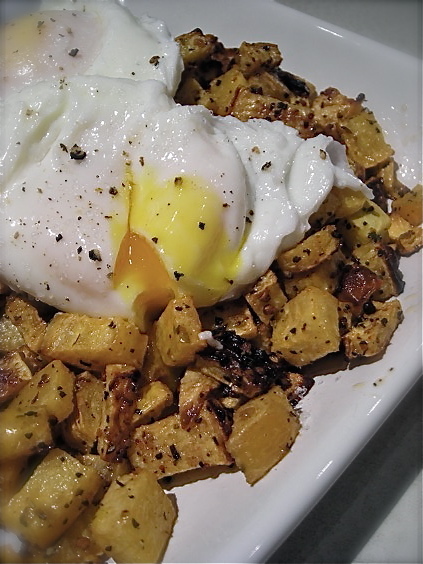 Still, the fact that I just knew this roasted rutabaga dish required a poached egg, that I then went ahead and made, beautifully, is huge growth for this egg lover. And I may never look back again. The roasted rutabaga has become, at this latest stage of winter, a rather treasured foodstuff. That and parsnips are slowly integrating themselves into my life and I welcome them warmly. I diced the rutabaga into small pieces and tossed them with some oil and seasoning and set the pan in a 400° oven. I stirred them once, and about 20 minutes later, they were toasty and browned, smelling fantastic. The egg poaching method is standard; a pan of water with a teaspoon of white vinegar, bring to a boil, create the vortex in the center and slip the egg into it, reduce heat and allow to cook to your desired stage. I made two, and they were both perfect. As was the evening, alone and content.